It’s a snow day! Oh boy! If you’re in Austin, and you have a chicken (a dead one), there has never been a better day to roast that mother. I’m going to give you my version of Thomas Keller’s simple roast chicken, and oh, friend, it goes down smooth. You don’t put butter, or oil, or anything but kosher salt and pepper on it just before it goes in the oven. I used to be of the opinion that roasted chicken should be slathered in butter before cooking, but this laissez-faire approach yields a chicken with crispy-schmaltz-y, delicious skin and lovely moist meat. It’s so chicken-y! Which is how it should be, if you’re using a happy little chicken from the farmers’ market- they’re perfect and need no adornment save a final bath in thyme-infused schmaltz. Really fun. Yum, yum, eat it up. Pat down your chicken obsessively, until it is perfectly dry. If you haven’t already done so, remove the little pillow of fat that’s attached to the front of the cavity of your chicken. (If your chicken doesn’t have this, see if you can trim some fat from other parts of the chicken). Remove the chicken from the oven, and put on a cutting board. Toss the fresh thyme into the skillet, and mix it in so it coats the potatoes. Tilt the skillet so that your chicken fat/thyme liquid runs to the side, and spoon some of this over the chicken, so that the bird becomes shiny with chicken fat and flecked with thyme. 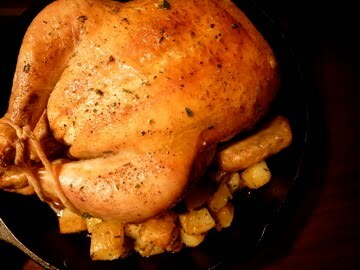 Allow the bird to rest for 10 minutes, then devour, along with those schmaltz-y potatoes. Ooohh- also, TK recommends that you serve this with a good dijon mustard and/or butter to slather on the chicken when you’re eating it. These are both lovely and delicious suggestions. Next Article Cookbook Time for Me! ARRRRRRRRRRRRG!!! That's the sound I make through my gritted teeth!!! DAMN those are some cute DOGGGGS!! I worship them for all eternity!!! THEY ARE PHYSICALLY PAINFUL TO LOOK AT!!! Also, your chicken looks nice. rupert ate two snowballs! snuggles daintily licked one.